Illinois judge agrees to hear suit (not filed by Trump) on Cruz’s presidential eligibility. 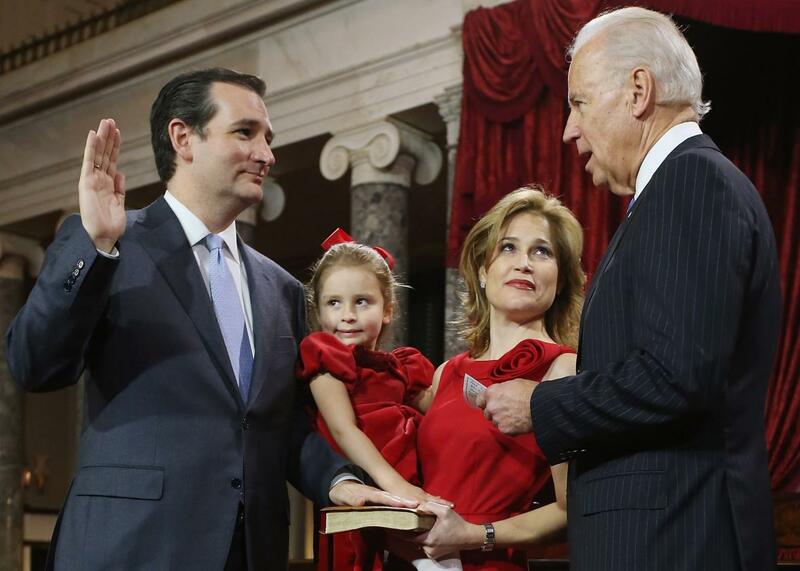 Sen. Ted Cruz’s reenacted swearing-in ceremony in the Old Senate Chamber at the U.S. Capitol January 3, 2013 in Washington, DC. Donald Trump clearly enjoys needling Ted Cruz about his Canadian roots, which obviously are not inherently problematic eh, but do raise some still simmering constitutional questions about Cruz’s eligibility for the presidency. The lingering issue is the exact definition of the “natural born citizen” requirement to become president. In essence: Do you need to be born on American soil to qualify or can you, say, qualify if, like Cruz, you were granted citizenship as the son or daughter of an American citizen? The fact that Cruz was born north of the border to an American mother and lived there until he was four may seem pretty secondary to the current debate about the future of the country, but there are still Americans that question Barack Obama’s eligibility to be president and he’s already living in the White House. There’s also the Trump factor. On Friday, Trump appears set to get more fodder for his sly jabs at Cruz because an Illinois judge has agreed to hear a lawsuit challenging Cruz’s inclusion on the Republican ticket there. Lawrence Joyce, an Illinois voter, filled the suit contesting Cruz’s candidacy based on his birth outside of the United States after the state Board of Elections dismissed his objection earlier this month. The Circuit Court of Cook County in Chicago will hear the case. Joyce appears to be concerned, not with the innate constitutionality of Cruz’s candidacy, but with the political fallout if he wins the Republican nomination. “[Joyce’s] concerned about what could happen if Cruz is the Republican nominee, saying the Democrats could file a challenge in the fall,” ABC 7 in Chicago reports. “At that point, all of his fundraising would dry up. And his support in the polls would drop dramatically. He may be forced at that point to resign the nomination,” Joyce said. It’s a familiar argument made by Cruz opponents, namely one Donald Trump.